Customer Portal payment methods for Invoice payments or B2B checkout can be configured as described here. View details for the available gateway providers and their associated configuration options. Payment/Credit Card (CC) gateways or ACH gateways (USD only) may be configured to allow for payments to be accepted online. Supported Payment Gateways are listed below, along with an associated vendor URL. For multi-currency environments, payment gateways must be configured for each currency ISO code separately, even if multiple currencies share a single gateway. If a currency is not configured to accept payments, customers who are assigned that currency in SAP Business One will not see the payment options but will be able to see other details (such as account balance) in their assigned currency. ACH Payments are only available for USD Invoice Payments. ACH is not supported during B2B Checkout. 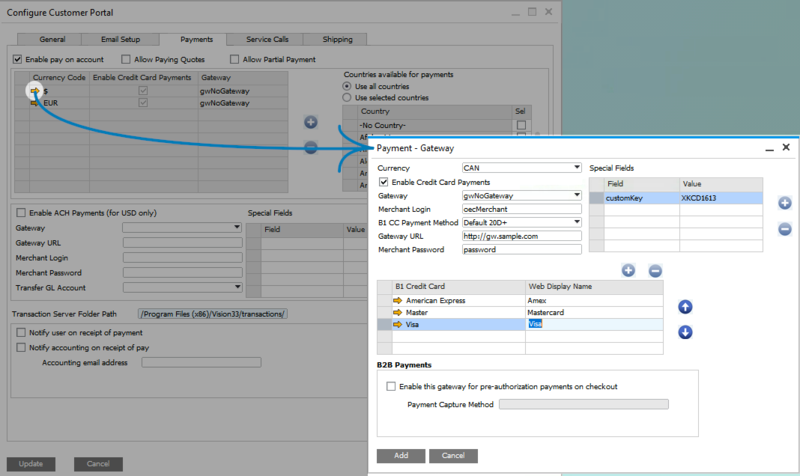 When configuring Payment Gateway information, ensure all relevant fields are completed. Supported gateways are listed below. For descriptions for each field, see Customer Portal Configuration - Payments Tab. Otherwise, follow the instructions below to set up a payment gateway. (Both CC and ACH) In SAP Business One, open InterConnect Manager AddOn > Administration > Customer Portal Config. Select the Payments tab. (CC Only) Open the “Payment - Gateway” screen using the add (+) button. (CC Only) Select the currency that this gateway will apply to. Note that when a single gateway can be used by multiple currencies, then each currency must be mapped to the same gateway settings separately. In this case, when gateway credentials need to be updated, they must be updated separately for each currency. (Both CC and ACH) Select a Gateway from the drop-down (see markers 2 or 11 above). (Both CC and ACH) Enter the gateway’s URL (see markers 3 and 14 above), as provided by the gateway vendor. (Both CC and ACH) Enter the merchant login (see markers 4 and 12 above), as provided by the gateway vendor. (Both CC and ACH) Enter the merchant password (see markers 5 and 15 above), as provided by the gateway vendor. (ACH Only) Select the Transfer GL Account to be used by payments that use ACH. (CC Only) Select the B1 CC Payment Method to be used by payments that use Credit Cards. (Both CC and ACH) If required by the gateway vendor, enter custom field/value information. Note that many gateways do not require Special Fields, so these may be blank. (CC Only) Add any B1 Credit Card types that will be accepted by this gateway. If the Credit Card option is not found in this list, the customer will not be able to use it as a payment option. Note that each Credit Card must be linked to a GL Account that is set up to accept payments in that currency. For example, say PayflowPro accepts USD and CAD payments. One entry for PayFlowPro will use CAD, and a second entry, created using the Add (+) button will use USD. In the Payments section there will be 2 PayFlowPro settings, both with the same username and password, but each with a distinct currency. We haven’t tested all of the gateways listed here. Specifically, we’ve tested with Authorize.NET, BeanStream and Moneris. Gateways that haven’t been tested should work, however additional configuration may be required to enable these gateways and these additional configuration steps are not contained in our documentation. It is also possible that modifications to our software may be required to enable the listed gateway. If this is the case, we will provide a fix for customers with valid maintenance and running a currently supported version of our software. As individual Gateways update their services and software, it is possible that our software may become out of step with the current gateway implementation. If this is the case we will work with our 3rd party payment gateway provider to get the updated component and, assuming the Portal is a current actively supported version, we will provide a hot fix through support. If an older version of our Portal software experiences this problem, we may likely require upgrading to a more recently supported version to generate a hot fix. n/a gwDPI This gateway is no longer in service. n/a gwGoRealTime This gateway is no longer in service. n/a gwIBill This gateway is no longer in service. n/a gwIOnGate This gateway is no longer in service. n/a gwPayready This gateway is no longer in service. n/a gwViaKlix This gateway is no longer in service. n/a gwECHOnline This gateway is no longer in service. ~uSight Gateway Post-Auth~ gwUSight This gateway is no longer in service. n/a gwEFSNet This gateway is no longer in service. n/a gwProtx This gateway is no longer in service. n/a gwOptimal This gateway is no longer in service. n/a gwPayStream This gateway is no longer in service. TransFirst Transaction Central Classic gwTransactionCentral http://www.transfirst.com. n/a gwPaygea This gateway is no longer in service.